Polypharmacology is a new paradigm that has replaced the old view of single-target drug discovery. We put our expertise in systems biology at the disposal of our clients to explore the network of human proteins in search of multi-target therapies. As increased understanding of biology supports the view of living beings as highly complex networks of interconnected proteins, the dominant assumption of single target drug discovery is being abandoned in favour of a new paradigm that advocates for the simultaneous modulation of several targets. 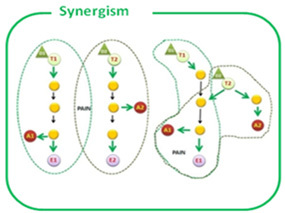 Polypharmacology, as this approach is known, is sustained by observations of the robustness and redundancy of biological systems that hinder the success of single-target treatments. Thus, multi-target therapeutics can exhibit greater efficacy and overcome drug resistance by impacting multiple nodes at the same time. Additionally, synergistic modulation of various proteins may decrease the risk of adverse events, since lower doses of drug can be administered to achieve the same therapeutic effect. Anaxomics’ proprietary method, TPMS, explores pathophysiological maps of diseases to identify drug combinations that modulate various targets in a synergistic manner. If you provide us with one compound in your pipeline, we can find another drug that enhances its efficacy against the studied pathology. Our expertise in systems biology guarantees that your results reach the desired outcome in terms of efficacy and safety.